- 3002 (Narrow Stile Lock with Thumbturn, Key Override, Passage, Lockout, Cylinder Guard). - 3010-19-41 (31/32" Backset, Right Hand or Right Hand Reverse). - 3020-19-41 (31/32" Backset, Left Hand or Left Hand Reverse). - 3030-19-41 (1-1/8" Backset, Right Hand or Right Hand Reverse). - 3040-19-41 (1-1/8" Backset, Left Hand or Left Hand Reverse). - Select Finish: Duranodic (55) or Satin Chrome (26D). - Cylinder: Sold Less Cylinder. For matching Cylinders see "Companion Items" below. - Delivery: The Simplex 3002 Pushbutton Lock is in stock and available to ship. - Special Orders: For pricing on any Simplex 3000 Lock not on this page please contact Taylor via e-mail (sales@taylorsecurity.com) or call 1-800-676-7670. The Simplex 3000 Series mechanical pushbutton lock provides exterior access by combination for narrow stile aluminum glass doors. This fully mechanical lock eliminates the material and labor expense of battery replacements, has a single access-code and is programmed via the keypad without removing the lock from the door. The 3000 lock is designed for use with Adams Rite 4510/4710 latch mechanisms (not supplied). Any standard MS Mortise Cylinder that operates the Adams Rite latch will function with a 3000 Series lock. 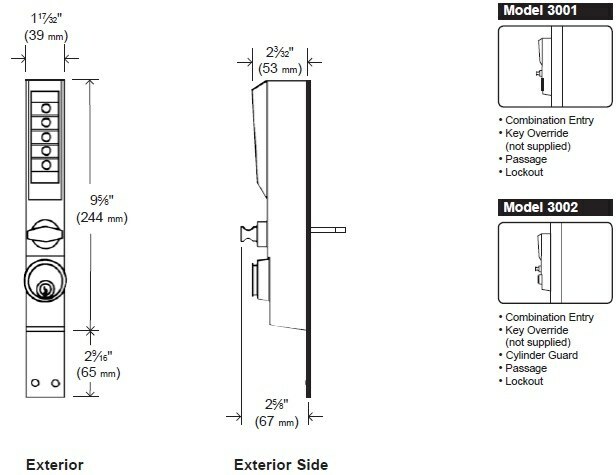 Locking Device: Adams Rite 4510/4710/4910 mortise latch. Handing: Non-handed; required drive assembly is factory-handed, not field reversible. Passage Mode (3001 & 3002) - allows access without using the lock entry code. Feature activated from the outside using cylinder override key. Lockout Mode (3001 & 3002) - disables the lock so that entry code cannot be used to gain access. Access is permitted using the key override only. This is activated from the outside using the cylinder override key. Strike: Sold separately (Adams Rite or Kaba Ilco Corp.). Stile Width: 1-7/8" minimum, required for mounting. Finish: Duranodic (55) & Satin Chrome (26D). - 3010-19-41 - 31/32" Backset; Right Hand or Right Hand Reverse. - 3010-19-41 - 31/32" Backset; Left Hand or Left Hand Reverse. - 3030-19-41 - 1-1/8" Backset or 1-1/2" Backset; Right Hand or Right Hand Reverse. - 3040-19-41 - 1-1/8" Backset or 1-1/2" Backset; Left Hand or Left Hand Reverse. Special Order Information: For pricing on any function, keyway or finish of the Simplex 3000 Series not found on this page please contact Taylor Security direct via e-mail (sales@taylorsecurity.com) or call us toll-free at 1-800-676-7670. Backset: Model 3010: Right Hand; Right Hand Reverse - 31/32" (25mm). Model 3020: Left Hand; Left Hand Reverse - 31/32" (25mm). Model 3030: Right Hand; Right Hand Reverse - 1-1/8" (29mm) or 1-1/2" (38mm). Model 3040: Left Hand; Left Hand Reverse - 1-1/8" (29mm) or 1-1/2" (38mm). Door Thickness: 1-3/4" (44mm) maximum. Stile Width: 1-7/8" (48mm) minimum, required for mounting. Items Supplied Include: Installation instructions, full-scale template, combination change key, and screwdriver.